Thank you to all who participated and to Fr. Mike for joining us! You can also view Mass in ASL each Sunday Live on Facebook at "Deaf Catholic Community / St. John Deaf Center"
Certified, but not quite comfortable interpreting Mass or other liturgies? Know ASL and want to know more? Come for some fun practice, great presentations and practical resources. NB: These sessions are geared toward individuals who have at least *some* knowledge already of American Sign Language. Does your parish offer a subscription to FORMED? Some resources are captioned, including Symbolon! Check out the content list HERE. Includes DVD- all dialogue is in ASL, all text and worksheets are in Spanish. "My First Eucharist" New! Online-based sacramental preparation materials from NCOD. Includes lesson plans, activity materials, and online videos, including vocabulary. Available in Spanish soon! 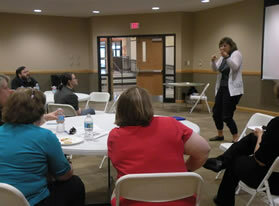 Religious ASL (RASL) Week (Diocese of Rockford, IL) Click HERE for more information! - NOTE: does not include language of revised Roman Missal. Signing the Scriptures, Year A,B and C by Joan Blake: It is important to note that these books do NOT provide pictures of the signs, but the word order for the readings, using the ASL syntax. The Bible: ASL version Online videos of Scripture in ASL, with an APP available! Many other resources for adults and children as well.